This post is all about exploring the CLR loader to load an assembly from GAC and from private bin path. This is not possible because, if an assembly is loaded from GAC and if the code uses Assembly.LoadFrom to load the same assembly, then the loader would return the assembly that has already been loaded from the GAC. If you notice the code creates an instance of the “Class1” in the Form1 constructor, this will essentially load the ClassLibrary2 in to memory. FYI the ClassLibrary2 is GACed when the application launches. Here is the fusglovwr output , which shows the assembly being loaded from GAC. LOG: Binding succeeds. Returns assembly from C:\Windows\Microsoft.Net\assembly\GAC_MSIL\ClassLibrary2\v4.0_1.0.0.0__3a0a06f4596f3e16\ClassLibrary2.dll. After verifying fuslogvwr output , I uninstall the assembly from gac using gacutil /u (without closing the app). After which I click the button1 ,which will call the Assembly.LoadFrom to load the same assembly from private bin path. And here fuslogvwr output of loading the assembly using the load from, notice GAC lookup was unsuccessful. LOG: Attempting download of new URL file:///C:/Users/naveen/Documents/Visual Studio 2010/Projects/WindowsFormsApplication4/bin/Debug/ClassLibrary2.DLL. LOG: Binding succeeds. Returns assembly from C:\Users\naveen\Documents\Visual Studio 2010\Projects\WindowsFormsApplication4\bin\Debug\ClassLibrary2.dll. Notice the first assembly is loaded from the GAC and the second one is loaded from the bin path. This is not something that I would ever do. This was merely an exercise to bypass the loader. FYI when the assembly is uninstalled from GAC, the gacutil.exe creates a temp copy and stores the assembly in the temp directory because it is being used by a process. And the temp copy of the assembly is deleted when the process ends. 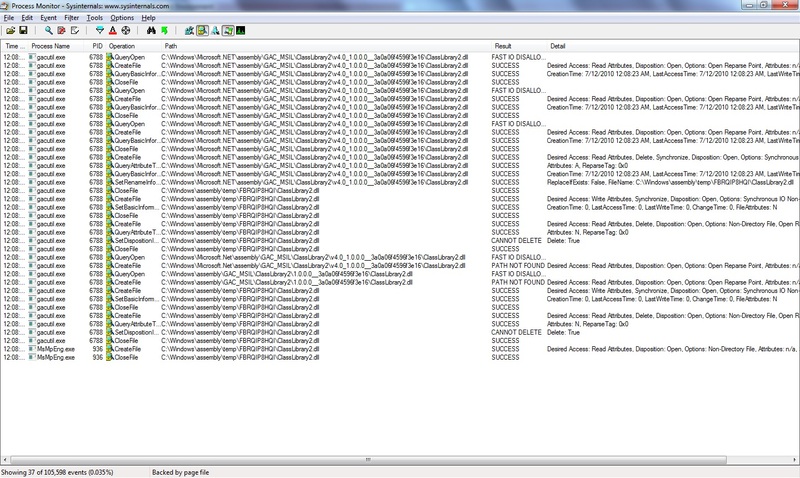 Here is the screen shot of Procmon creating an temp copy of the GACed assembly which I uninstalled.